These days it is hard to tell where golf shoes end and street shoes begin. There are many “hybrid” models which work well in both places, some even better off the course. Case in point is the new FootJoy “City” shoe. This is a hybrid golf/street shoe which may find more time in the office than on the course. I’m not referring to the tread/bottom of the shoe when using the term hybrid, or speaking to the tread’s versatility on and off the course. I’m talking about its style. The FJ City is a full grained leather shoe, guaranteed to be waterproof for two years. The leather is very soft, sharp looking, breathable, and comfortable. The footbed of the shoe provides great comfort and features vibration and shock absorption, making walking around the cubicles or the cart paths enjoyable. There are spiked and spikeless models available. The City pictured in this article obviously is the spikeless version, and gets more wearing time from me off the course than on. There are two styles available currently, regular and wingtip. 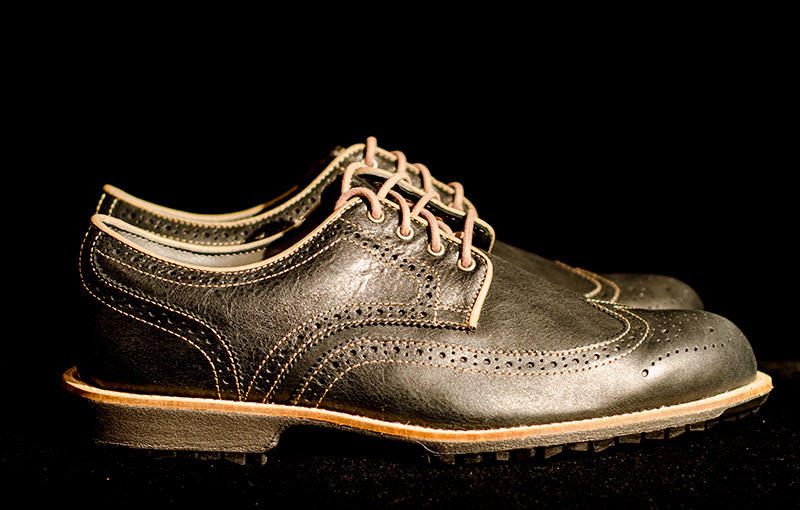 Photos in this article are the black mocha wingtip model. Each style has three colors available. The wingtip colors are black mocha, tobacco, and off-white. The non-wingtip model colors are gray, tan, and white. Sizing for men ranges from 7-15, while women’s models range from 7.5-13. I’ve been quite surprised at the traction and performance I get with the spikeless version of the FJ City on the golf course. On appearance alone, the spikes don’t look like they would be close to as effective as they are. From a comfort standpoint I’ve really loved the City model, and it gets more comfortable the more I wear it. Stylewise I feel a little silly in the summertime wearing wingtip shoes and shorts, but that’s how I roll. I really dig wearing the FJ City shoes, well, in the city. Even after long days at the office or post-long walks around town, my feet, lower joints, and back are fresh. I do have a small critique/beef. My City model is black/mocha in color. I’ve been finding that these don’t match many “black” items in my massive golf apparel collection. When comparing the City’s black to other blacks, they appear like a very dark blue. The versatility and style of the city shoe is matched by its great performance and comfort, whether on the course or out on the town. Great shoes. Check out the HOG FJ City image gallery. Other Hooked on Golf Blog FootJoy reviews.